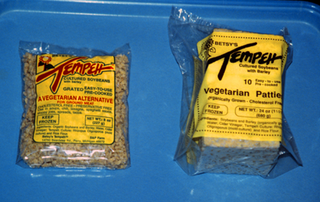 Betsy Shipley and Gunter Pfaff started a small tempeh production company called Betsy's Tempeh in the mid 1980's on their organic farm in Michigan, USA. We built a 1000 sqft ferro-cement building (by hand) and the inspector considered it the best in the state. 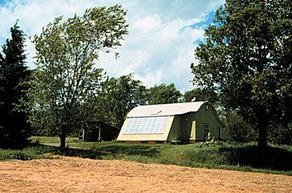 In the front we had a greenhouse which helped heat the facility during the winter. Since we had been making our own tempeh already for a couple of years - on trays - we developed a new process to make tempeh on stainless steel trays. To our own taste and that of our friends, tempeh made on trays tasted much better than the usual tempeh which is produced in plastic bags. Making tempeh on stainless steel trays was considered impossible at that time and our novel approach resulted in two patents (apparatus and method). 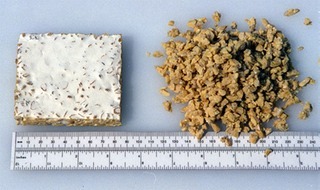 See: New Technology for making Tempeh"
The resulting tempeh was superior to other tempeh on the market and our version was a great success with retail customers as well as restaurants and institutions even though we charged 50 cents more per pound. People also found it enormously helpful that we delivered it as patties and grated. When the time came to either expand or retire, no one could be found to continue Betsy's Tempeh - otherwise you would have found it in your favorite store for the past twentyfive years. So we retired and moved several times. Off and on people have tracked us down to ask for help in making Betsy’s Tempeh. If anyone ever wanted to help tempeh become more mainstream we would suggest the creation of a Tempeh Research Institute in conjunction with a university for further exploration of this promising food. We would enjoy working with interested groups like co-housing groups, church groups, neighborhood groups. We are especially eager to hear from people who want to start worker owned tempeh production coops either in the city or the countryside.